Few days ago FFmpeg finally got WMA3 decoder. This event gives me an opportunity to look at our achievements. Popular and/or standard codecs — supported except for the newest stuff (AAC-HE, H.264 interlaced modes, VC-1 interlaced modes). Windows Media — WMV1-WMV3 are supported (except for beta version of WMV3 and other WMV3 spinoffs). WMA1-WMA3 is supported too. We still have WMA Lossless and WMA Voice to RE and our top men are working on it (did you remember “Raiders of the Ark” ending? Neither did I). Real Media — RV1-RV4 are supported, from the variety of audio codecs only Sipro and Real Lossless support are missing. Sipro is in the works and nobody (including RealNetworks itself) cares about RALF. Intel codecs — Indeo 1-3 is supported, patch for Indeo 4-5 is available, IMC is supported, IAC is not REd (and not in queue). RAD codecs — REd, there are still some issues with Bink to sort out before inclusion. AVI codecs — that’s a mess. There are simply too many very codecs and new ones still continue to appear. Some are supported, most are not. 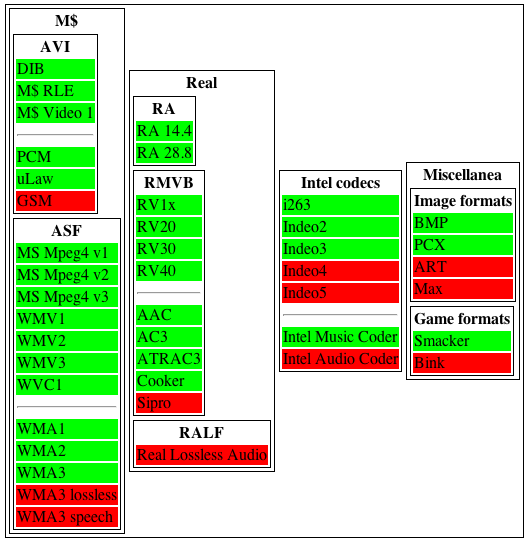 Lossless audio codecs — some are supported, some are not. Again, looks like everybody writes own lossless audio or video codec. I’d like to get support for TAK though. If you think there’s some codec we definitely should support, please tell us (preferably with specification or decoder sources 😉 If you just want to have some codec support in FFmpeg — make us interested in it, some codecs support appeared in FFmpeg after somebody had said “can play that file?”.